Alarm Your Tires and Rims! Digital Tilt Sensor: �Provides alarm protection against any attempt of jacking or towing of your vehicle. The Digital sensor automatically adjust itself to angle that your�vehicle is parked. The sensor will trigger an aftermarket alarm system by�detecting any deviation of angle within 1-3 degrees. 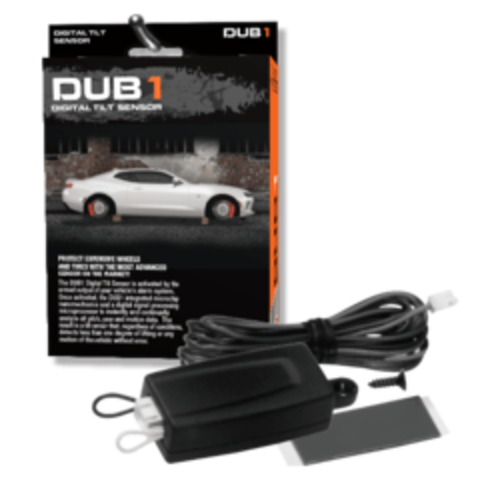 Single Stage Instant Trigger:�The sensor is�used�to instantly trigger your aftermarket alarm system upon any attempt of jacking or towing of your vehicle before they even get the wheels off the ground! Self-Adjusting�Tilt�Levels: Automatically�adjust itself to the angle that your vehicle is parked on. Status LED:�Built-in�Red LED indicates sensor detection status. With the�LED�off the sensor is in stand-by.�Red indicating instant trigger output is active. Exit/Arm Delay:�Once the vehicle is exited and the doors are closed, and after the alarm is armed, the sensor delays 60 seconds while�adjusting too and protecting the current angle. 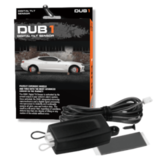 Compatible to the Majority of�Aftermarket Alarm Systems:�The DUB1�is made by Code Alarm�and�the 3-pin/3-wire plug end meant to plug into specific Audiovox & Code Alarm systems can be cut off and directly�wired to any installed aftermarket alarm system that is equipped with a�negative instant�trigger input. We have installed and used these sensors on dozens of different aftermarket alarm systems�from Viper to Bulldog systems. Simple 3�Wire Hook-Up:�Require's constant 12V power connection, Ground when armed output wire from your system and a�negative instant alarm trigger input connection�to your system. Sensor Module Placement:�For optimal coverage the sensor�is located�under the driver's side dash�and mounted as parallel�to the vehicle as possible. Cannot be installed under the hood. Interior installation only. Compatible to Aftermarket Alarm Systems Only:�The sensor will not trigger OEM/Factory installed alarm systems. 30 Day Return Policy: Any item purchased from MotorCityRemotes.com can be returned for a full refund (no restocking fees!) or exchange within 30 Days from date of delivery (sorry, no reimbursements for shipping rates apply) as long as the product is in the exact condition as received. No returns/refunds on any applied electronics, warranty repair or replacement only.